Read Mary's Women Involved Interview! I grew up during a time when learning to ride a bicycle as a child was a rite of passage and began riding when I was six or seven years old. Riding meant you could expand your radius beyond where your two feet could take you-- go to the park, ride to the library, scoot around town with friends. Bicycling is a social activity for me and one of my primary ways of maintaining my fitness. My husband and I met through bicycling. Our first date was a 100-mile tandem bike ride. We were talking this weekend during a ride that, for us, the bike is like our kitchen table. It’s where we chat and connect. We create shared experiences through our riding and I love that. I have bikes that are a real pleasure to ride, which also encourages me to get outside. Every bike has a slightly different feel, you know? I love seeing where and how far my bike can take me. I like attempting new physical challenges. It’s engrossing. Bicycling often rewards in its own way. A big climbing effort is rewarded by a spectacular view and the possibility of a zippy downhill. A delicious endorphin rush can result from an exhilarating off-road segment. A mighty tailwind relieves after miles and miles of pushing and makes all the slow hard work worth it. Most of the events I participate in are randonneuring (www.rusa.org) events, called brevets. These rides are all about honoring all who finish within a prescribed time limit and not who finished 1st, 2nd, or 3rd. My husband and I ride brevets with our local club, the D.C. Randonneurs (www.dcrand.org). Randonneuring is a way for me to test my endurance and cover a lot of ground in a condensed span of time. I like to describe some of the rides like living two days in one. You see the sun rise, sunset, and later the moon and stars peep out. Sometimes you ride until the sun rises again. It’s tiring to do that, but also invigorating, and one of the best ways I can imagine spending my day. Last year, my husband and I wanted to expand beyond randonneuring and do some off-road tandeming. We rode the Hilly Billy Roubaix http://chasingmailboxes.com/2014/06/23/hilly-billy-roubaix-i-am-trying-to-break-your-heart/ , a 72-mile ultra-cross race that takes place in Morgantown, West Virginia. It was an endorphin-filled adventure rife with steep ups and downs, twisty descents, gravel, and mud. Paris-Brest-Paris (PBP) is my absolute favorite cycling event http://thedailyrandonneur.wordpress.com/mgs-pbp-2011-you-have-to-go-to-know/. Held every four years, PBP is a 1200K ride (760 miles) that riders must complete within 90 hours. It starts on the outskirts of Paris and goes to the town of Brest, located on the Atlantic coast. PBP has its origins in racing, and was first run in 1891. Since that time, it has grown into a citizens’ ride, and is the ultimate international randonneuring event. People from all over the world participate in PBP. In order to ride it, on must successfully complete four qualifying rides that range from 200K (125 miles) to 600K (375 miles). Some race PBP for time, but many of us are out there just to have a good ride and to simply experience the thrill of being part of this unique and historic event. Bike touring is the best! It’s the most satisfying way I’ve found to explore the world around me. I can cover so much more ground than when I’m running, but unlike a car, bike touring is completely immersive. Unlike a bicycling event, there is no time limit or prescribed route. I can choose to ride gravel or pavement, go short or long, and stop when I feel like it. My husband and I bike tour together on our tandem. I like the simplicity of using only one bike for the both of us, but it requires a lot of teamwork because you are always working together to get down the road. I grew up riding a mix of pavement and gravel in rural Iowa in the 80s and 90s. Little did I know then that gravel grinding would become a thing decades later. I remember learning the ways of gravel—stay away from the soft edges of the road, keep your eye out for a good line in the road, don’t be afraid to slip a little on your bike. I don’t do tree roots or technical trail. For now, pavement mixed with off-road surfaces is the combination I like. Whenever I attempt a new challenge, I go through a bout of nerves. Pre-event jitters, I call them. It’s something I just seem need to do. I work out all my worries and nerves before actually attempting the challenge, and when the challenge comes my head is generally clear and my nerves are replaced with determination and focus. Yes, I use SPD pedals. I like them because they allow me to pull up on the pedals as well as push down on them. Now I’m completely addicted because I love wearing Sidi shoes—beautiful Italian goodness. Thoughts for those who are thinking about going clipless would be to only consider it if they really want to do it. There’s no requirement that a clipless pedal system is essential to ride. I know several cyclists who ride in regular shoes and they go over 200 miles in one day. That said, if somebody wants to try it out, I do recommend SPDs because they are so ubiquitous and you will have many shoes to choose from. Tighten the cleat down as much as you can on your shoe. Loosen up the pedal so that you can clip in and out easily. Carry an extra cleat bolt with you because they can fall out. I ride almost every day in Washington, D.C., which has been making great strides to improve its bicycle infrastructure over the last few years. We have more bike lanes, and we now have a robust bikeshare system in the city, Capital Bikeshare. I see so many more bikes on the road than when I started commuting ten years ago. It’s awesome! With this increase, though, there have been some tensions in the community. Drivers slag on cyclists for not obeying the rules of the road and sometimes drivers are upset because they have to share the road with us. Cyclists and pedestrians also experience their own tensions with each other. To manage some of that, I tend to choose routes that are not primary arteries for car traffic and where I can easily ride in the street. If I have to take a sidewalk for some reason (some of our bike routes are actually on sidewalks), I make sure to be considerate of the pedestrians and other travelers around me. I try to keep in mind that most of us are trying to get from point A to point B safely and without incident. I also try to anticipate the many ways that traffic flows so that I avoid sticky/dangerous situations. I commute year round, regardless of weather. In Washington, D.C., most days are rideable, and as long as there is not snow or ice on the ground I will ride. My bikes all have fenders to protect me from rain and most have 32mm tires or wider, which makes it easier to ride the city streets, which can sometimes be rough or contain debris. I also have some beautiful winter pieces and a quality rain jacket. I also carry a helmet cover, just in case I need it. Investing in good gear reduces the barriers to commuting in inclement weather. I have been in a couple of accidents. In one, someone made a left turn in front of me and I bounced across his hood. I have also been doored. I’ve also taken a tumble when I was riding tandem off-road with my husband. Fortunately all of these occurred at slow speed, and I experienced no major injuries. I think that made them less difficult for me to recover from on all levels. Bicycling allows me to live the way I want. Instead of relying on a car, I rely on my bike to meet my daily needs. I use it to commute to work, fetch groceries, meet up with friends, and to do most other errands. Like I said earlier, the bike is my kitchen table. It’s how I hang out and socialize with friends and it’s one of the main ways my husband and I spend time together. 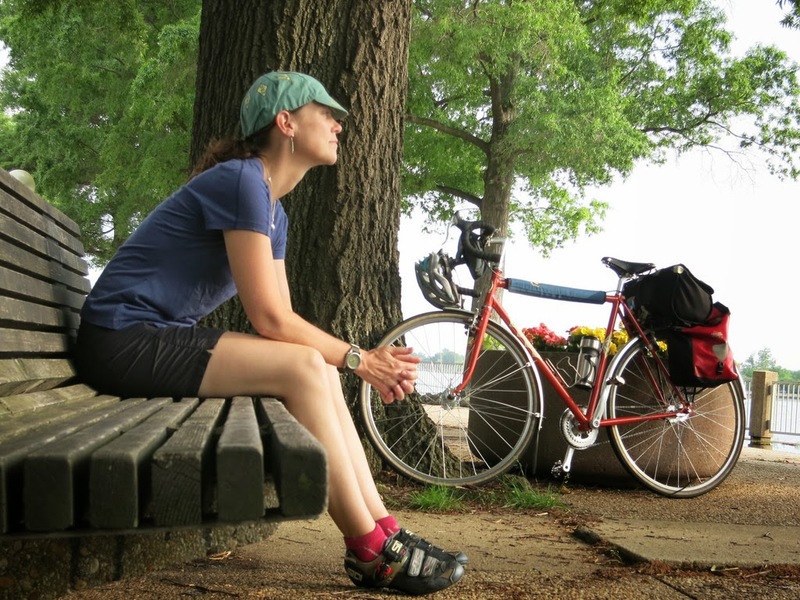 My bike is my primary vehicle for exploration and many of my weekends and vacations are spent bike touring around with my husband. 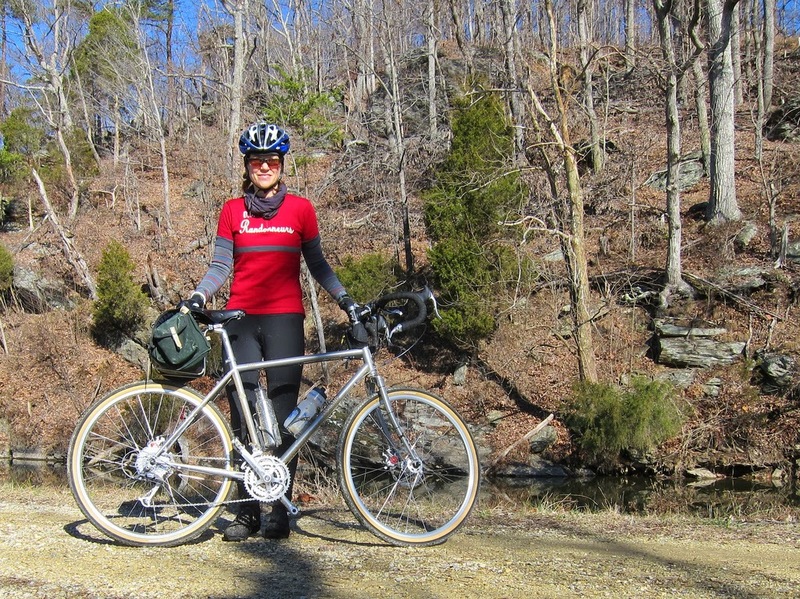 I gravitate toward bikes that are versatile and can take fenders and tires wider than 28s. Most of my bikes are steel, and I am partial to touring frames and their relaxed geometry. 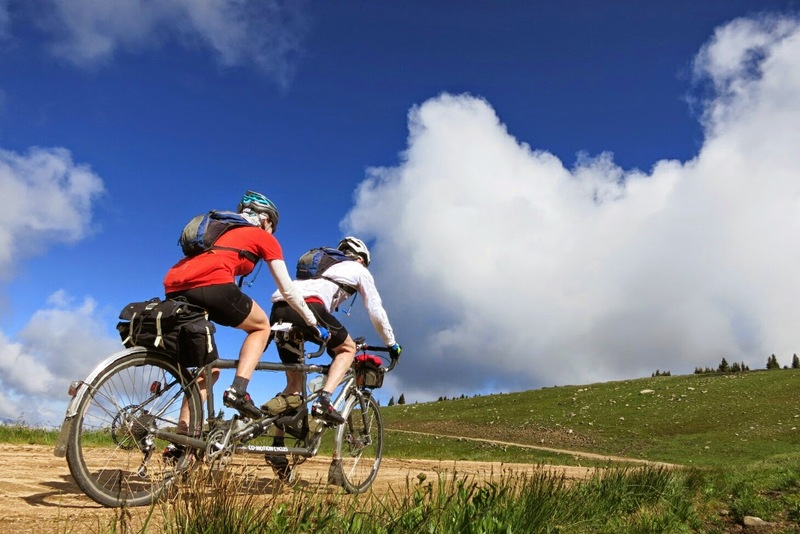 My husband and I have a custom tandem, a Co-Motion Java 29er that we use for touring and randonneuring as well as a Cannondale mountain tandem– which is aluminum– that we use for off-road riding. I own a Bike Friday Pocket Rocket, which is a packable flyer and ideal for something like paved light touring. My Surly Long Haul Trucker and Rivendell Quickbeam are perfect for bike commuting and grocery shopping. I use my Rivendell Romulus and Rawland Nordavinden for century rides and brevets/randonneuring events, if I’m not on the tandem. I also have a Bike Friday Tikit, which is a fast-fold bike designed for commuting and multi-modal transport. I really enjoy trying out different bikes and using them for various purposes. When I commute I do not generally use bike-specific clothing. I’m a big fan of the skinny jeans and a t-shirt. So easy and utilitarian, and my pants don’t jam in the chain. Perfect! When I bike tour or randonneur, I wear a lot of Ibex wool http://shop.ibex.com/. They feel good and last for years. I have several of their jerseys. I also use many baselayer wool pieces from Icebreaker. For long rides (over a century) I use Sugoi RS shorts. They just work for my body. I have personal favorites for carrying stuff when I ride, too. On commutes, I use a Rickshaw Pipsqueak handlebar bag http://www.rickshawbags.com/pipsqueak-handlebar-bag.html, It is small yet easily holds my phone, keys, and a small wallet. The bag snaps onto the handlebars without a lot of fuss.